As governments sacrifice the value of national currencies to meet policy goals, currency diversification is no longer just an option. It is necessary for the prudent investor’s financial survival. In The Sensible Guide to Forex,Cliff Wachtel provides a roadmap to the confusing landscape of foreign exchange currency trading. He takes you from complete ignorance about Forex trading to the competence necessary to profit from trading while protecting the hard earned capital required to enter the market. If you are serious about succeeding in Forex, here is a sane conservative approach for individuals interested in gains either as traders or longer-term investors with no interest in directly trading currencies. Possibly the best intro to forex you can find, whether you’re an aspiring trader or long term investor who is interested to add more diversification to his portfolio. It covers the fundamentals clearly and comprehensively, then applies them with detailed examples of how to identify, plan, and execute low risk high yield trades. It then provides a vast variety of ways to profit from forex markets that will appeal to a range of skill levels, risk tolerances, and personalities, even to long term investors just seeking to identify the strongest forex trends and best assets to ride those trends. These include the first ever in depth look at the innovations in forex trading, social trading and binary options. Both simplify and shorten the path to lower risk, higher yield returns. The extensive coverage of risk management and the psychological dimension shows you how to survive the learning period with your capital and confidence intact. Like a fine wine of investment wisdom, Wachtel’s advice has been honed and improved over decades of learning and teaching, doing and inspecting, scrutinizing his own work and the work of the greats. Surely one of the best theorists around on forex — heck, on investing — Wachtel had delivered a whopper of value-packed, sage goodness in his Sensible Guide to Forex, perfect for the beginner and more advanced value-oriented investor. 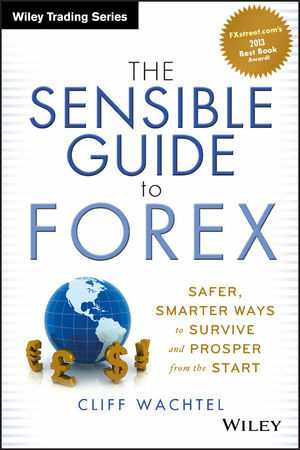 Warning: once you read this book, you can’t help but begin using forex as an integral part of your investment strategy. But don’t worry, Cliff will shepherd you through, every step of the way. Mauricio Carrillo, FXstreet.com US Manager. @MCarrilloFX. This book is an insightful introduction to the world of forex. Wachtel leads the novice trader on a journey of discovery from the most basic concepts in the forex market to more sophisticated trading strategies. What stands out is his honesty. Wachtel doesn’t sugar coat the FX market, instead he shares the idiosyncrasies of this market and de-bunks a few FX myths along the way. He also introduces some of the latest developments in the retail forex market from social trading to binary options. Wachtel’s broad knowledge of this market makes this book an interesting read for those who want a thorough insight into the world of FX. In an ever-evolving field, it’s rare to find a guidebook so helpful and timeless as Cliff Wachtel’s Sensible Guide to Forex is. This book gives both current traders and new traders the perspective they need to take their Forex trading to the next level. Cliff’s book is a must read cogent cohesive compendium of the realities of forex! I’ve been in the trading business for 35+ years–success is all about intelligent risk management. The book’s relentless emphasis on risk and money management is the reason that in all those 35 years, this is the first investment book I’ve bothered to finished in the past 20. For the novice, first he arms you with the relevant info to keep you from immediately lose your shirt, so that you survive the learning process with most of your cash and confidence intact. Then he takes you step by step through a number of paths to profitability. For the pro, he reminds us of the rules we all strive not to violate every day because we’re human. He also provides the first in-depth coverage of two new and potentially very useful ways to tap forex, social trading and binary options. This book was the only source I’ve found for in depth and objective coverage of either of these intriguing new ways to tap forex markets with potentially less effort and better returns. The one forex book written for the risk averse mainstream investor or trader who is intimidated by forex but now understands that we all need currency diversification as much as asset or sector diversification. While forex may have a reputation for high risk, this is the only book I’ve ever seen that offers multiple ways to do it with less risk, and often less time, effort and expertise, yet still achieve exceptional returns. Chapter One is a must read for any new trader and investor on why they should be involved in the growing Currency market. He makes a compelling case for how we are living in an age of money printing and zero interest rates that will kill the purchasing power of our savings. As Cliff succinctly puts it: “the need for currency diversification is one of the most important lessons of the Great Financial Crisis” When he discusses the concept of the “Carry Trade,” I couldn’t help thinking that if you can’t live and work globally, then own the currency(or assets denominated in it)! This book details, with exceptional clarity, honesty and intelligence, all the different areas of Forex, including the latest ways to trade or invest that are so new they’ve never been covered elsewhere-social trading (linking your account to mimic the moves of chosen, proven expert traders) and binary options. Another unique feature is the extensive coverage of how longer term conservative investors can diversify their portfolios by currency exposure just like they’d diversify by asset class and sector. Even if you don’t want to trade, you can learn how to identify the currencies with the strongest long term trends and build portfolios of stocks, bonds, or other assets that will ride these trends for greater safety and returns. What I liked most though, was that this is the only forex book I’ve ever seen that’s written for more conservative, risk averse traders. While forex has a high risk reputation, here’s one book that finally offers detailed, step by step guidance to identifying, planning, and executing low risk high potential yield trades. It provides the best illustrations I’ve ever seen of how to combine your analysis, risk, and money management into a complete trading plan. The book’s treatment of the mental/psychological aspect of trading is both brief yet exceptionally clear, comprehensive and practical. He shows you how to keep the right priorities, expectations, and mindsets so that you don’t become your own worst enemy through unrealistic goals or self-defeating attitudes. For example, did you know that there is a difference between a winning trade and a good trade? Or how to avoid the dangers of both winning and losing streaks? Another refreshing feature is the unusual objectivity with which he approaches forex. He doesn’t sugar-coat the risks, obstacles, or the time and effort needed to succeed. Long time readers of his articles over the years know that Cliff has no axe to grind, but rather just seeks to educate and call things as he sees them. For those short on time, expertise, or trading capital, he offers multiple alternative ways to get exposure to the best currencies. The only real downside of the book is that it’s long – it’s not a quick start guide, I guess because given his thoroughness, Cliff probably doesn’t believe in quick start guides to forex any more than quick start guides to brain surgery. The good news is that the book’s table of contents is detailed and the book is organized in a way that makes it easy to skim for what you want without having to read through parts that aren’t of interest. In an era of money printing and historically low interest rates, the major currencies are at risk of losing their purchasing power, and of dragging down anyone whose assets are denominated in them. Cliff has written a timely, essential tool for financial survival, and it fits the saying: Give a man a fish; you have fed him for today. Teach a man to fish; and you have fed him for a lifetime. If you’re curious about the Forex market but aren’t sure where to begin, you’ve found the answer. This Sensible Guide to Forex provides exactly what its title suggests – practical, understandable explanations of Forex basics on both the technical and fundamental levels. As a website that deals with daily Forex analysis and market developments, the DailyForex team has met hundreds, if not thousands of Forex traders who are eager for a solid understanding of the industry but who haven’t quite connected the dots. Reading the Sensible Guide to Forex will provide both new and moderately experienced Forex traders with the realistic understanding they need to take their trading to the next level. The book omits all of the marketing hype typically associated with the industry and focuses on everyday applications of Forex strategies. This book has been necessary for a long time – kudos to Mr. Wachtel for taking the initiative to record these ideas in writing. Pingback: The Most Common Fatal Investor Mistake – Part 2: GBP Pounds UK Investors | Forex Trading Tips - handy tips and on advice on trading forex! Pingback: The Most Common Fatal Investor Mistake – Part 2: GBP Pounds UK Investors | Forex Market Advice - tips on the forex!